Hey Everyone! I am back at it again! I have been recovering from a RL accident, but recently came back in time to help launch the Anniversary event for Free*Style. I have missed you all, and am sorry for the sluggish pace the blog has been in. We will amp it back up again shall we? Supa8 is open, with all sorts of interesting things in store for you all. I have a love of tentacles, so was happy to see all the octopus products in the event space. These stockings from AlaskaMetro are what I based the whole outfit off of today. They come in 12 different colours, each pack comes with 3 to choose from. TMP, Slink and Omega appliers are all included as well. One pack is even free for everyone to enjoy! You can also try your luck with a few of the gacha machines, while you are at Supa8. Luxuria has a super fun one, and the rare prize is this cute tattoo, which looks like a classic styled tattoo, but is actually pixilated like the old school video games. Tattoo includes classic layers, and an all in one Slink/Maitreya/Omega Applier. Carver's End is almost over, but you still have a few days left to run through, solve the mysteries and grab some great gifts generously donated by some awesome designers. 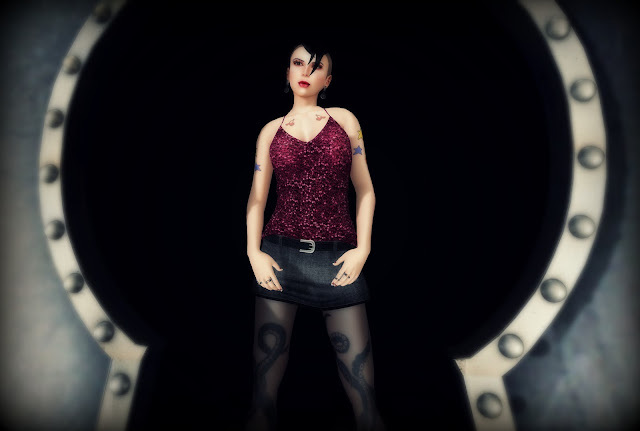 This outfit is from Somnia, the top and skirt can be worn separately, and they come with a colourchange hud. You are looking for rats, and they are ALL over the place. There are well over 60 of the lil rats to find.